Novitherm Heat Reflectors – Novitherm Heat Reflectors have been recognized as a best practice in Living Green Environmental Management Standards Manual. 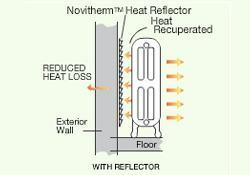 Utility companies periodically run Novitherm Heat Reflector incentive programs to help customers reduce gas heating consumption and energy costs. 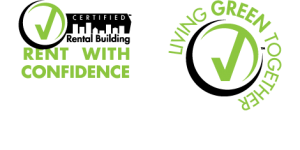 Customers include residential, multi-res, small commercial and institutions. 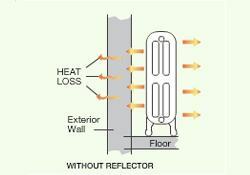 Property managers and owners, as part of energy saving measures and to improve tenant’s comfort, install Novitherm Heat Reflectors allowing them to reduce boiler water temperatures and heating costs. 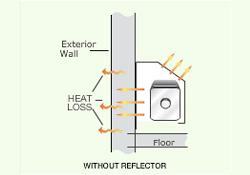 Hospitals, Schools and Places of Worship challenged with increased energy costs can improve budget outcomes by installing Novitherm Heat Reflectors and benefit from heat savings. 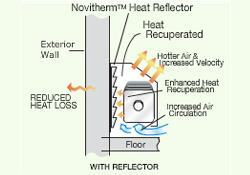 Homeowners installing Novitherm Heat Reflectors find the increased comfort allows them to turn down the thermostat by a few degrees therefore saving dollars on energy costs.